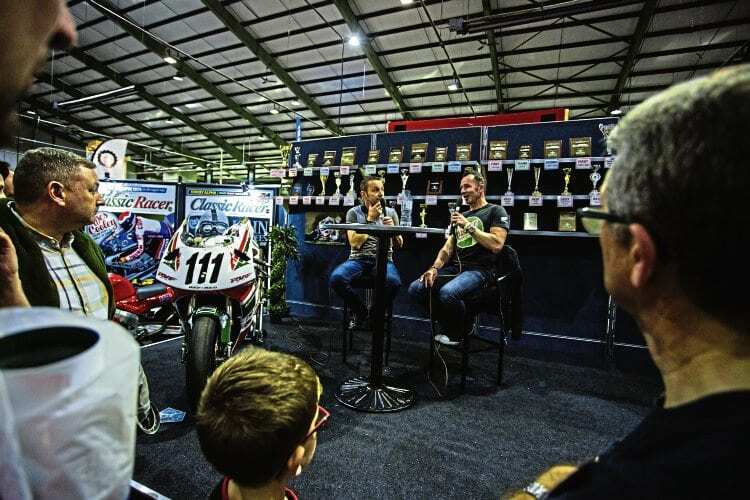 Even the weather played ball for the 24th Carole Nash Classic Motorcycle Mechanics Show at the Staffordshire County Showground on October 14-15, when former Kiwi World Superbike star Aaron Slight told entertaining stories on stage with compere Steve Plater. Aaron Slight keeps visitors entertained during a live interview with Steve Plater. After each session, large queues formed of people who wanted to meet Aaron and have items signed. Bill Millar’s 1967 Bridgestone 350 GTR, displayed in the private entries area, was judged best in show, but such was the quality of machines on show that the judges’ task must have been more difficult than ever. Suzuki RG500s, displayed in the Suzuki Village, and the 500cc Gilera four and Bob Tait 750cc two-stroke triple from the Sammy Miller Museum. The RG500s were fired up along with a handful of replica Aaron Slight Castrol Honda RC45s in the Classic Racer GP Paddock on the Sunday. Read more in the November issue of OBM – on sale now!